Robert Huth believes Stoke City team-mate Ryan Shawcross should be a regular in future England squads. Stoke captain Shawcross, 23, received a call-up for the friendly match against Egypt in March 2010 but did not play. 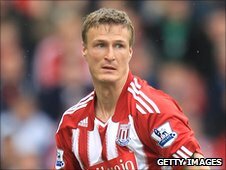 "Ever since I've been here, Ryan's been great for the club and has been playing well," Germany international centre-back Huth told BBC Radio Stoke. "He got in the England squad last year and I think he should be more of a regular in the squad than he is." Huth added: "Obviously I don't pick the team, but if I did, he would be in my team." Shawcross won two caps for the England Under-21 side in 2008 and was rewarded for a series of fine Premier League displays for the Potters with a call-up to the senior squad. However, he remained as an unused substitute for the 3-1 victory over Egypt at Wembley. Huth, meanwhile, has not given up hope of playing international football again for Germany. The 26-year-old, who was part of the squad that finished third in the 2006 World Cup, has not played for the national team since June 2009. "Every player wants to play for their country and it hasn't quite worked out in recent times," added Huth, who has won 19 caps. "The main thing is your club, and if you play well for your club, you hopefully get a chance. It hasn't happened yet, but hopefully next year."